SEOUL, Oct. 19 (Yonhap) -- Members of teenage K-pop boy band The East Light have been beaten and verbally threatened by a producer and the head of their management agency, one of the members claimed Friday, vowing to take a legal action. 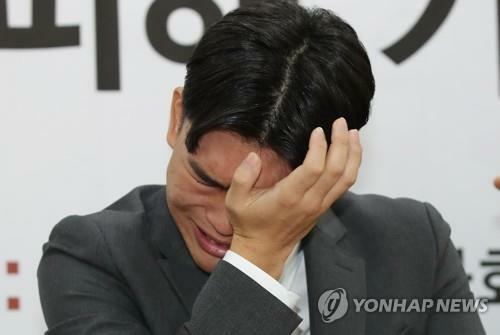 Lee Seok-cheol, the 18-year-old band leader and drummer, held a press conference and confirmed a media report a day earlier that Kim Chang-hwan -- the chairman of Media Line Entertainment -- and a resident producer had assaulted or connived in assaulting the members before and after the band's debut in 2016. The teenage members of the six-member r ock band competed in local music shows with some success before debuting on the K-pop scene under the management firm run by Kim, an established K-pop figure who has produced music for such famous artists from the 1990's as Kim Gun-mo and Clon. "From 2015 to 2017, (we) were habitually beaten with a baseball bat or a steel microphone while (we were forced into) the push-up posture in the practice room, the recording room or the rooftop," the tearful team leader said in the press conference. Referring to his brother, the band's bassist, he said, "(Lee Seung-hyun) has even been locked up in a studio and beaten all over his body by the producer." The producer once strangled the elder brother with a guitar cable for a mistake he made playing the instrument, he claimed. He said that he has been afraid of reporting the men to his parents because of the producer's threats. The younger brother is currently receiving psychiatric treatment, he said. "(We) have constantly been subject to violence, threats, child abuse and human rights violations. ... As a leader, I can no longer turn a blind eye to the wounds my beloved fellow band members and my brother have receiv ed," he said. Lee's lawyer, Cheong Ji-seok, who accompanied him to the press conference, said Media Line had ignored its previous pledges not to repeat the violence and to fire the producer accused of the abuse. 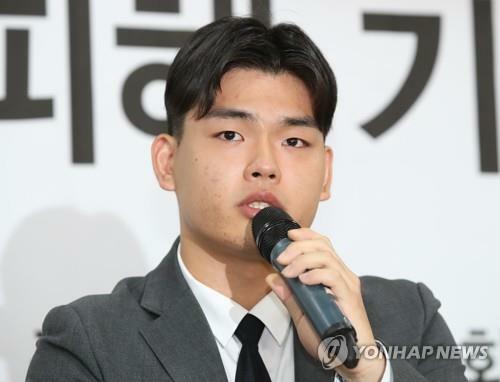 The brothers are planning to file criminal charges against them, the lawyer said, adding that he is willing to represent the other affected members of The East Light, if requested. He also said that Seung-hyun has been dispelled from the band after complaining about the issue. His elder brother is also planning to suspend his membership. In a media release, Media Line acknowledged the charges and apologized, but said Chairman Kim was not involved in the violent acts. "One year and four months ago, (the company) first learned that the beatings took place in the process of the producer's training and education of the members," according to the release. "There has since been no recurrence wh ile The East Light has continued its music career. But a deepening emotional rift with part of the members brought the issue to the fore," it said. The company denied the charges against Kim, saying that he had connived in neither the beatings nor the verbal abuse.